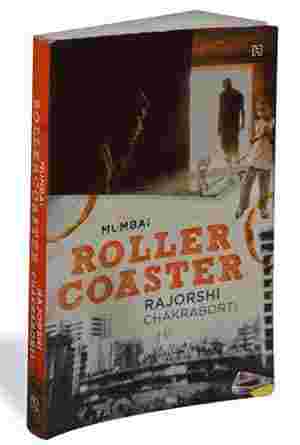 Mumbai Roller Coaster: Hachette India, 276 pages, Rs295. Rajorshi Chakraborti and his multiple personalities are pleasant company. If Derangements spoke in an intense hallucinogenic staccato, and Balloonists with youthful self-discovery, Mumbai Roller Coaster speaks in a precocious babble (“stream" is pushing it) of consciousness. The storyline is a liberal composite of teen references: from email conspiracies, inconveniently beeping cellphones, cults with Facebook memberships and dates at Barista to parents who fret about eligible matches. Also perfectly healthy for utter mystery is the you-never-know-if-it’s-justified air of complete paranoia: watched, tapped, threatened, even emailed, by Big Brotherly villains—all just too juicy to be true. Chakraborti’s ability to weave in and out of his multiple characters is heightened by the threads of happenstance that zigzag through the cityscape of south Mumbai. As with all his books, if you are not paying attention, you will be caught out. From the fisherman’s nephew-gardener Ganesh and gutter-bush-wall climbing chases to orphanages, to the terraces of posh 34-storey south Mumbai towers, and Lord have mercy bleak time-warped East Berlin, the character map and landscape are constantly changing. There is too much pace and not enough time to get into details, so Chakraborti never quite spells out how, exactly, the mall security officer morphs into the ticket collector at Dadar railway station into the threatening man at the orphanage into dirty policeman. It suffices that he does. Why is Ganesh, the super-capable, garden-trimming aide, so trustworthy? It suffices that he is. How do you cross countries without passports? How does one “hide" secret airports, even if your neighbourhood cult is the most powerful mafia on earth? Don’t ask. Seriously. Don’t. Like a hyperactive teenager whom you probably couldn’t get a straight answer out of if you tried, you mustn’t distract with needless fact. The coming together of the plot is too facile for it to be certified a crime novel. Yet the jagged edges between the turns are constructs that keep Chakroborti’s voice in control, nudging the reader to take the leap of faith with his gentle self-deprecating humour. It is precisely this inability to walk in a straight line towards an end point that keeps the narrative real. If you are not a fan of the first person, you will find the incessant jibing of the “sutradhar" contrived and annoying. Towards the end, when you discover why, somehow, it seems fitting.